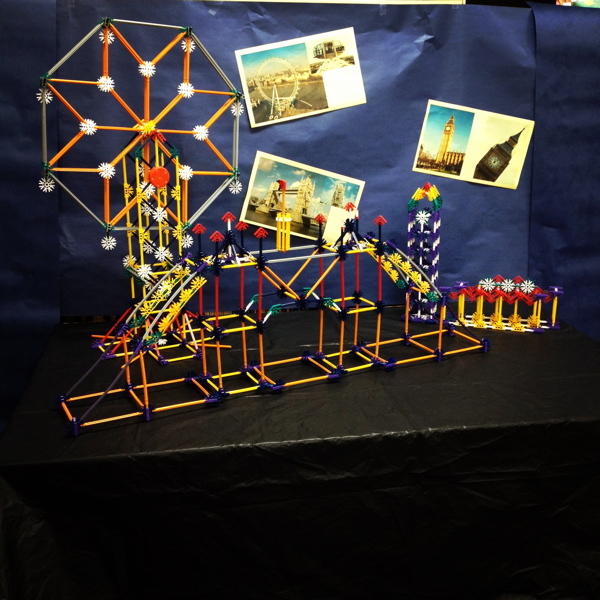 You may remember that a few weeks ago I wrote about how I started a K’nex club at my school. We’ve only had a few meetings so far, but the kids are loving it, and I feel like they’ve already really started to bond together. So far, I’ve started out each meeting with a brainstorming period and building for a specific goal during the first half of the meeting, and then let them have free time to work on their own ideas during the second half. This past meeting was the week before we started our British Invasion themed bookfair, so I decided to have my students build something that we could display. 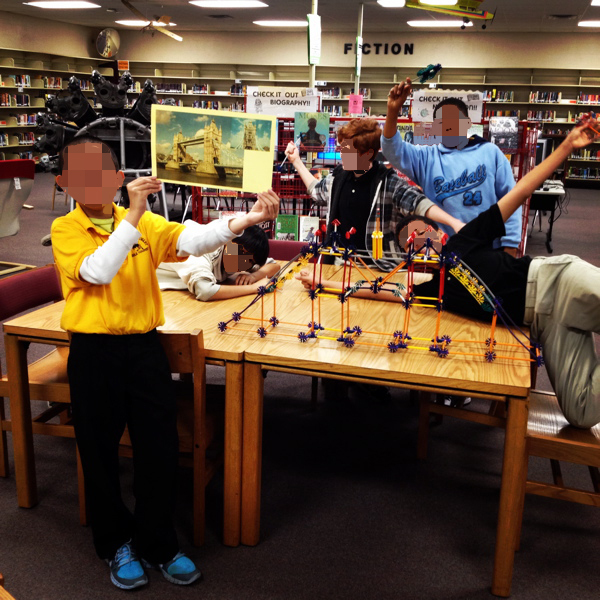 I thought it would be a good exercise for them to take a real object and recreate it with K’nex, so we built models of landmarks in London. To start the students off, I printed out color pictures showing different angles of three landmarks: The London Eye ferris wheel, Big Ben, and the London (Tower) bridge. As with the last meetings, I first had the students brainstom with their groups for five minutes. They used the chart paper and markers on their tables to sketch out ideas. Then they got to the building. This project was a little bit harder for them than the first one. They had more constraints, since these projects had to look like something specific. There was a lot of problem solving going on, and a lot of working to resolve disagreements among group members. 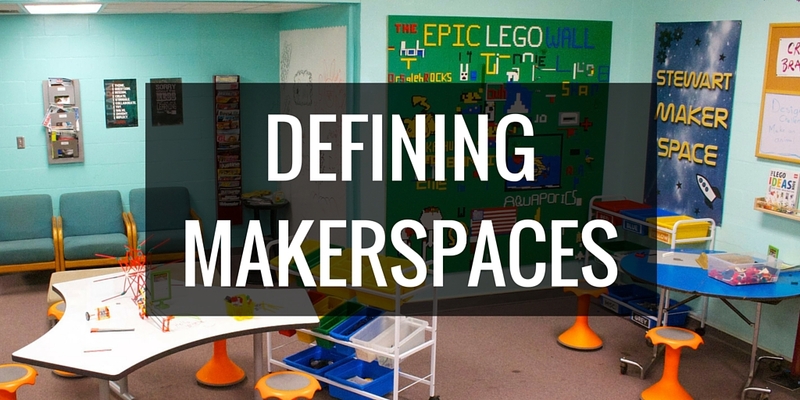 I circulated among the groups throughout the process, occasionally making suggestions or helping students resolve disagreements, but for the most part, the entire design process was all theirs. Even after we hit the half-way point of the meeting, most of the students kept working on their models. Several even asked for passes to come back during lunch to put the finishing touches on their projects. They put a lot of work and effort into their projects, and they were so proud of them when they were done. We displayed their finished models all week at our bookfair, and parents and students kept complimenting them. 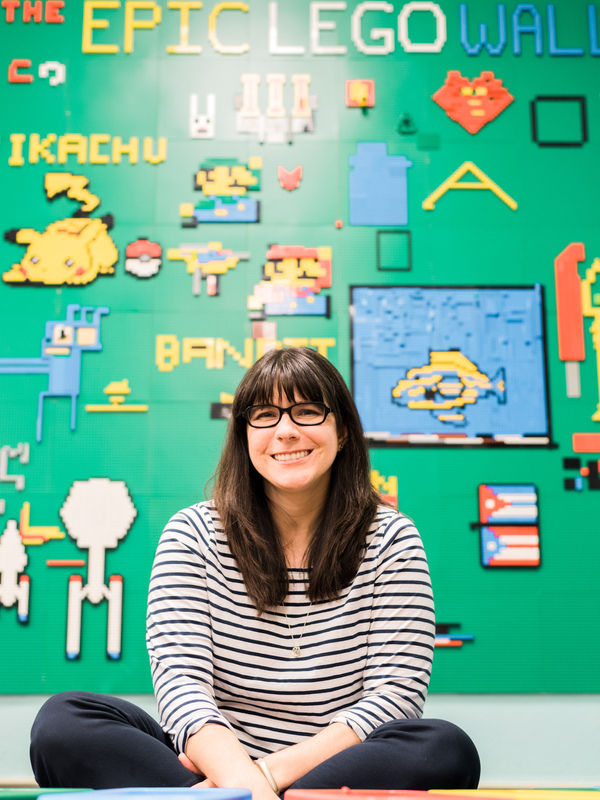 Whenever my K’nex club kids were in the room, they were telling all they friends – “I helped make that”. They were so proud of what they did. 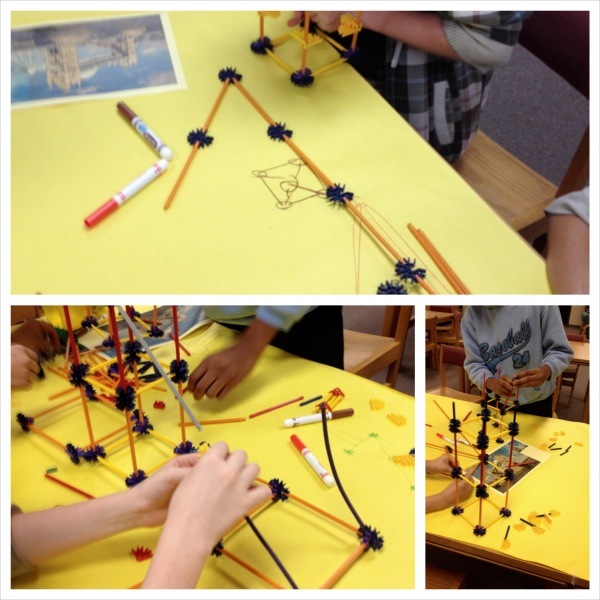 I’ve had so many students tell me this week that they wish they could join the K’nex club. Unfortunately, we only have clubs for 6th graders right now. I’m hoping next year to expand it to all grades. So what are they actually learning? Some may see these students as just having fun with some fancy toys. But they are learning, even if they don’t realize it. 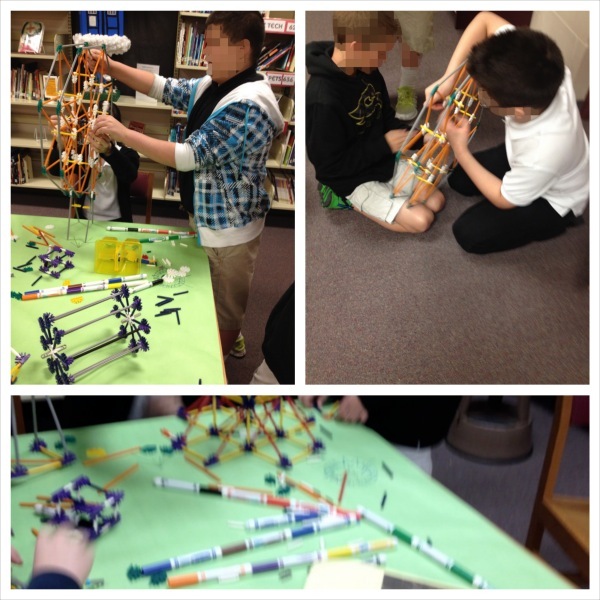 Collaboration and teamwork: These students have to work together to build their creations. They weren’t building five separate Big Bens – it was five kids working together on one Big Ben. These students have to share ideas, resolve differences, and work together. 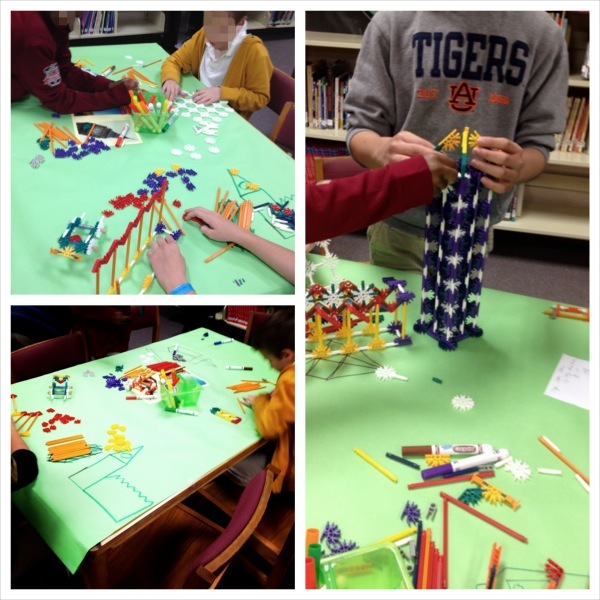 Thinking like a designer: The students had to work through the design process themselves. They had to take a bin of random parts and figure out how to put them together to create something that looks like something else. If this isn’t critical thinking, I’m not sure what is. Problem solving: The London eye group originally wanted bigger cars on the ferris wheel, but realized they wouldn’t fit, so they found a solution. The Big Ben group started out with a tight, small clock tower, but then realized it wouldn’t be proportional, so they changed their design. The London Bridge group found that the straight long rods wouldn’t fit part of their bridge, so they decided to use flexible rods instead. In each of these instances, the students were faced with a problem and had to find a solution. I’ve been having so much fun working with this group, and I can’t wait to see where we go from here! I would love to learn more about your program and start something like this at my school too. What is the best way to reach you to discuss? This is a fantastic non competitive yet creative way to get kids to socialize and learn skills.